Your marriage day is a time for splendor, for regal dress and lavish feasting, and a cake of cakes. 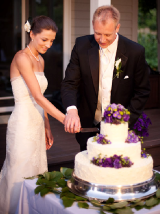 Wedding cakes should reflect the tastes, beliefs, and desires of the bridal couple. Wedding cakes are as magical as romance and as varied as brides and grooms. Today the classic tiered wedding cake is only one of the many styles a couple can choose from. The sweetest symbol of a couple’s new life together, a wedding cake can be a towering stack of tiers separated by columns and bursting with flowers, an architectural wonder with crisp edges covered in fondant or even a tower of cupcakes. A Cake made by Nicole is Beautiful and Delicious. 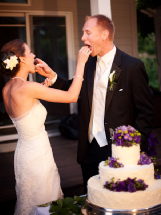 The crowning moment of any wedding reception comes when the bride and groom clasp their hands together and slice that first piece of wedding cake.